It’s finally the start of December and whilst that means stressing about gifts yet to buy, what to wear and remembering to send and give Christmas cards to all the right people it also means the opening of advent calendars. 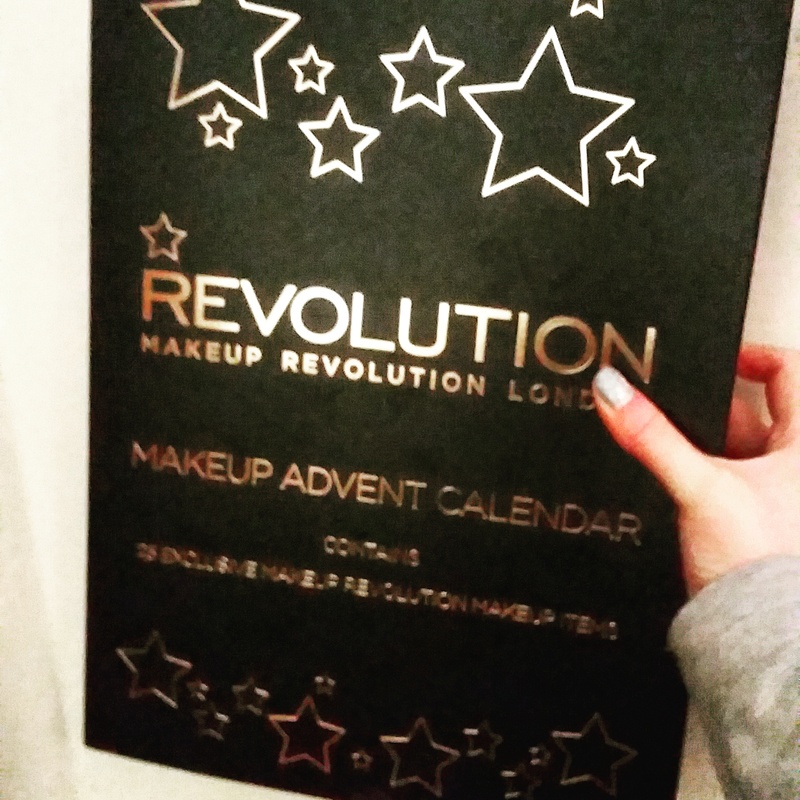 This year I have the Makeup Revolution one as my partner agreed to get me it as part of my Christmas present when it was half price in Superdrug. I love all of the products I have tried with the brand and find them to be great quality and even more so when you consider how cheap the items are. Each day has a window shaped in a similar way to the product so I knew before opening the window that the first day was going to gift me a nail varnish. I haven’t tried their polishes and because of the price I have to admit I was dubious about the potential quality. 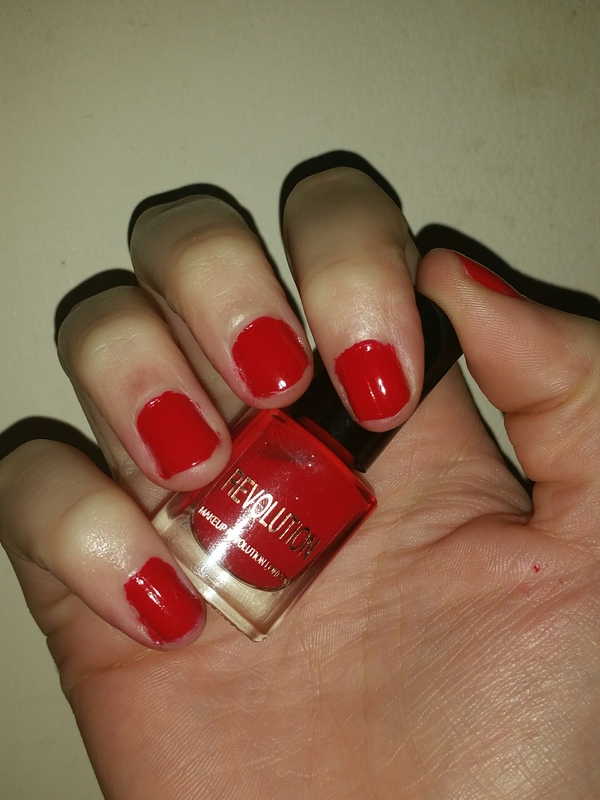 Opening the window (which proved to be a slight challenge) revealed a very red polish which is perfect to help get into the Christmas and festive spirit. It leans more towards an orange red than a blue red which helps it to pack that extra punch. I was curious about the packaging of the bottle and whilst in a few months down the road I will massively appreciate knowing the brand at the minute I just feel it looks a bit forced and cramped. It does have information about where it was made on the back which makes the bottle even more busy. It doesn’t seem to have a shade name or number though which will be fine unless they bring out ten different red shades. 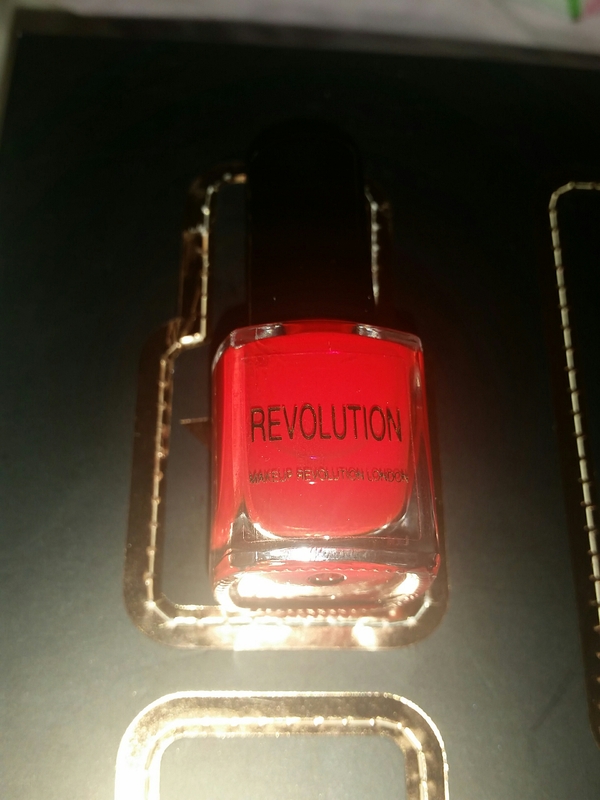 The formula of the product is actually incredible and it runs on the thinner side, but certainly not too thin, and feels better than some other higher cost polishes can when they are brand new. It was opaque after the first layer had been applied but I always tend to add two. It also dries super quickly ans is easy to clean up any edges. I’ll update you with how well it lasts and if it chips or stains when I do my next end of month nails update but so far I seem impressed and look forward to a couple more bottled delights. Do you have a beauty calendar this year? I’d love to know what you got today! This entry was posted in Beauty, Make Up and tagged 2015, advent calendar, autumn, bblogger, bbloggers, Beauty, beauty blogger, beauty bloggers, beauty product, bottle, chirstmas red, christmas, christmas spirit, december, fashion, fashion blogger, fashion bloggers, festive, gift, lblogger, lbloggers, Lifestyle, lifestyle blogger, lifestyle bloggers, Make Up, Make-up, makeup revolution, nail lacquer, nail paint, Nail Polish, nail varnish, nails, notd, partner, red, style, traditional, winter. Bookmark the permalink.